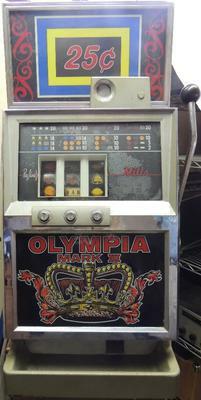 8/12/2015 Fredericksburg, Virginia - I have a Mills Olympia Mark III 25 cent slot machine that works. I have had it since 1987. Would like to sell it. It is in fair-good condition but mechanically works just fine. Have all keys. Email at robertandnina@va.metrocast.net.